Alive with the shhh-ing, sighing sound of the wind and the rushing, tumbling, tinkling percussion of water; and, when it is time, the bellow of the stag and the clash of warring antlers. Animated, too, with the soaring, circling, swooping of golden eagles; the constant bustle of ever-hungry buzzards; the pretty progress of grazing deer along the valley floor; the silent dashing and darting of fish in still, placid pools. Kissed, by the sea. 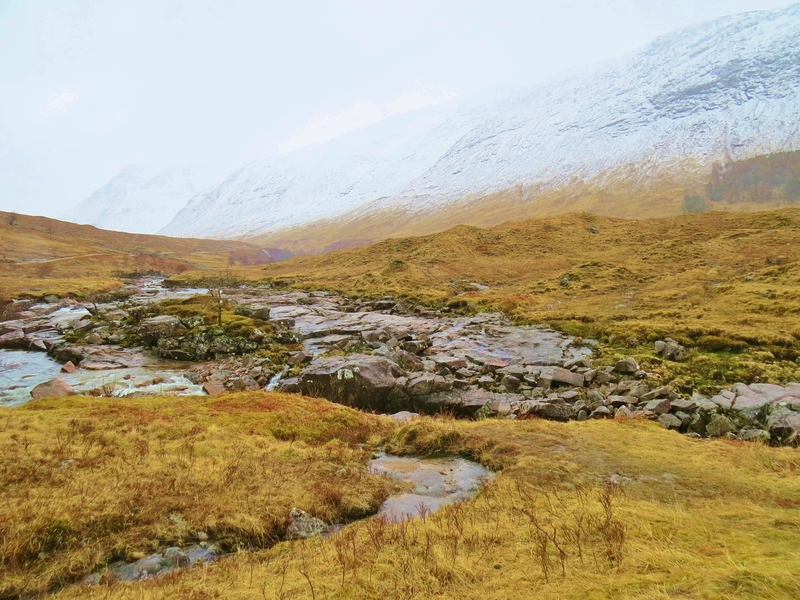 This is Glen Etive. Scotland has two types of lochs – fresh water inland lakes and salt water sea inlets – bays and fiords. Loch Etive is the latter, a fiord. It is 20 miles long, stretching all the way to Connel, just north of Oban. 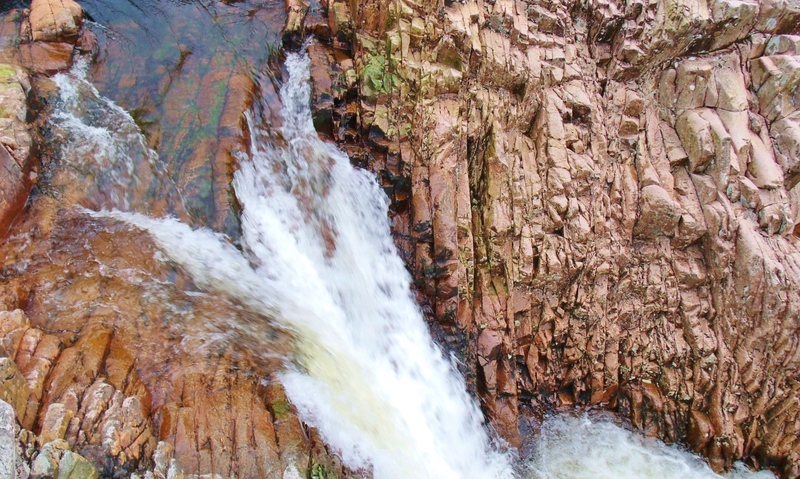 So much fresh water flows into it from surrounding glens and mountains that, with fresh water being less dense, it floats on top of the salt water. In places, the top two inches of water is potable. Fishing is excellent with a wide variety of fish including salmon; brown sea trout; rainbow trout; pollock; brownies; spurdog and mackerel in plentiful supply. The only road through Glen Etive ends at the derelict wooden pier where once pleasure steamers from Oban brought tourists to sample the delights of the glen. Today, a new concrete structure allows the Forest Commission to move timber felled in the glen down the loch in order to access more large-load-friendly roads. 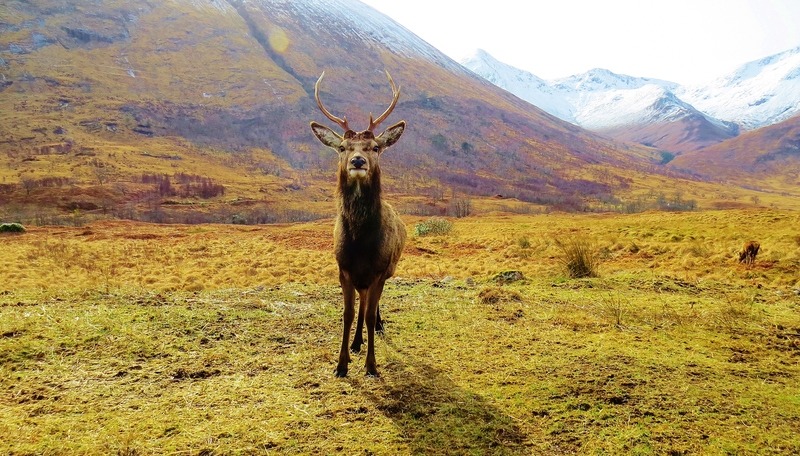 Deer can be seen frequently all over the glen as well as in the mountains. Only a handful are allowed to be hunted and killed each year. Tracking with a camera is fine. 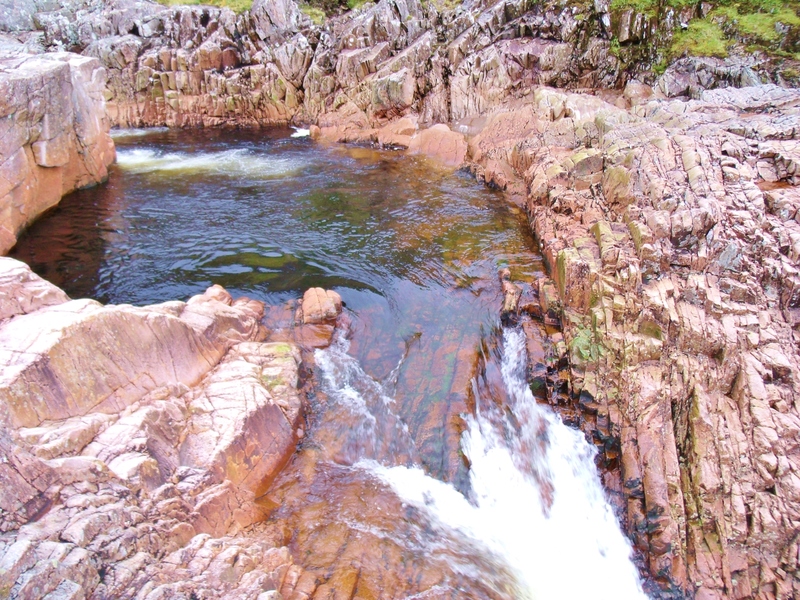 The River Etive, when it is in spate, is considered the best canoeing river in the U.K. 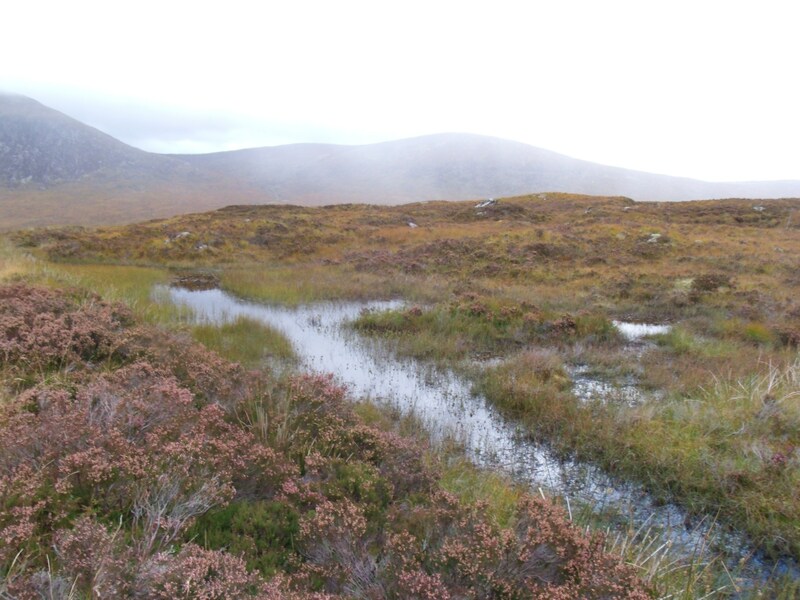 It has its beginnings high on Rannoch Moor, starting as a rivulet running out of Lochan Mathair Eitive, (Little Loch, Mother of Etive) and soon joined by countless other tiny trickles and streamlets. 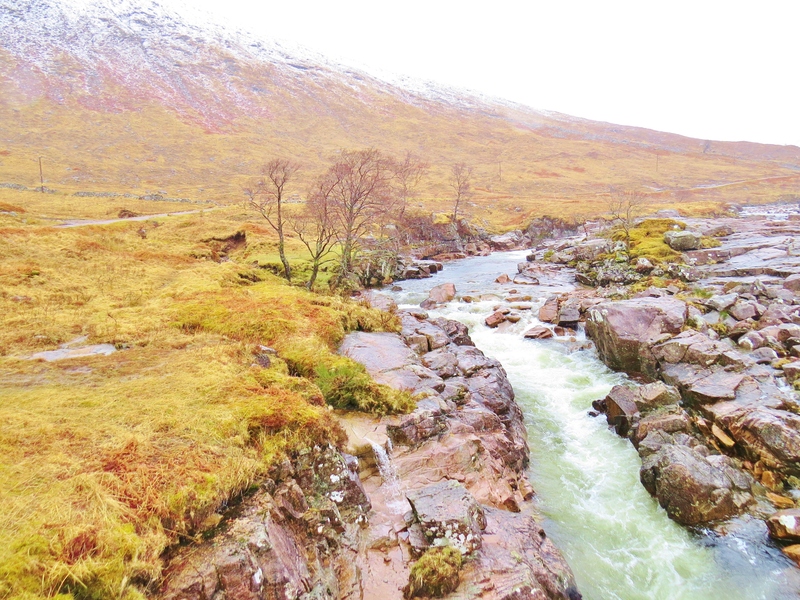 So the trickle becomes a rivulet and then a stream, constantly increasing volume and speed until, by the time it reaches the Kings House Hotel, where the moor ends and the descent into Glen Coe begins, it has become a fast-flowing river. 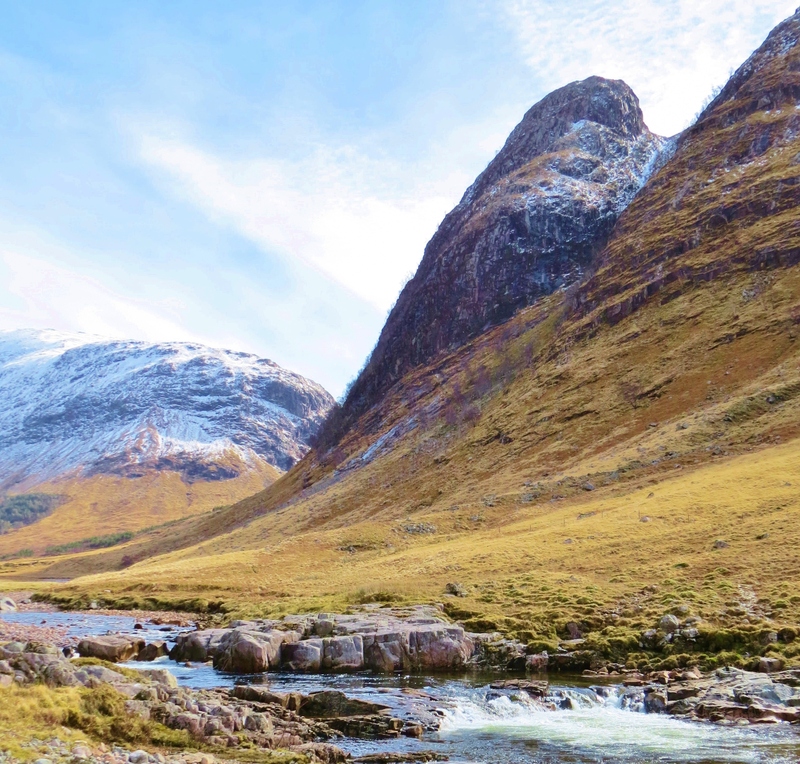 Instead of following the steep descent to the floor of Glen Coe, however, it heads North West around the base of Buachaille Etive Mhor, gathering speed as it flows through dramatic rock formations and tumbles in cascades and falls so loved by kayakers. By the time it has reached the floor of the glen, Etive’s progress becomes more sedate. Punctuating the flowing water, deep, still pools create welcome fishing and swimming holes. Sixteen miles from it’s beginning high on Rannoch Moor, the river empties into Loch Etive, from there to the Firth of Lorne and, eventually, with the ebb and flow of the tides, into the mighty Atlantic Ocean. 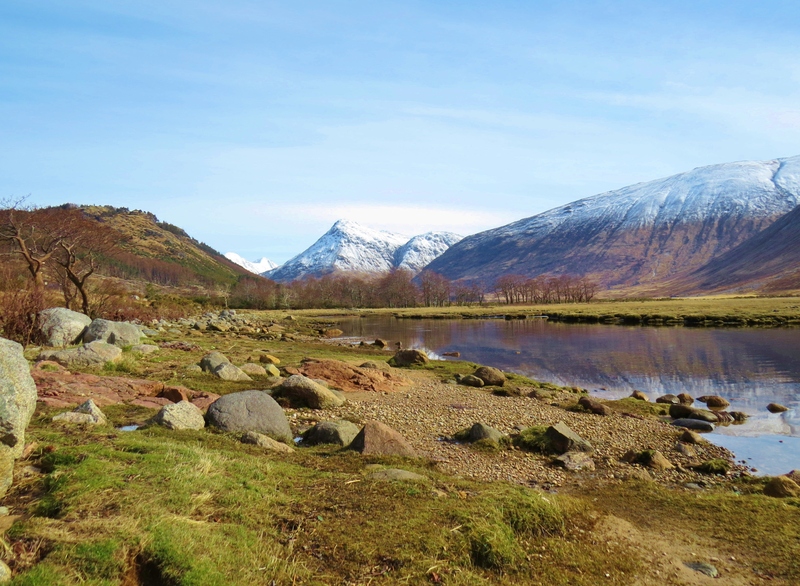 Although close to and geologically linked to world reknowned Glen Coe, until fairly recently, Glen Etive was a little known highland paradise. Now famed as the setting for several movies, including Skyfall, it attracts more visitors. 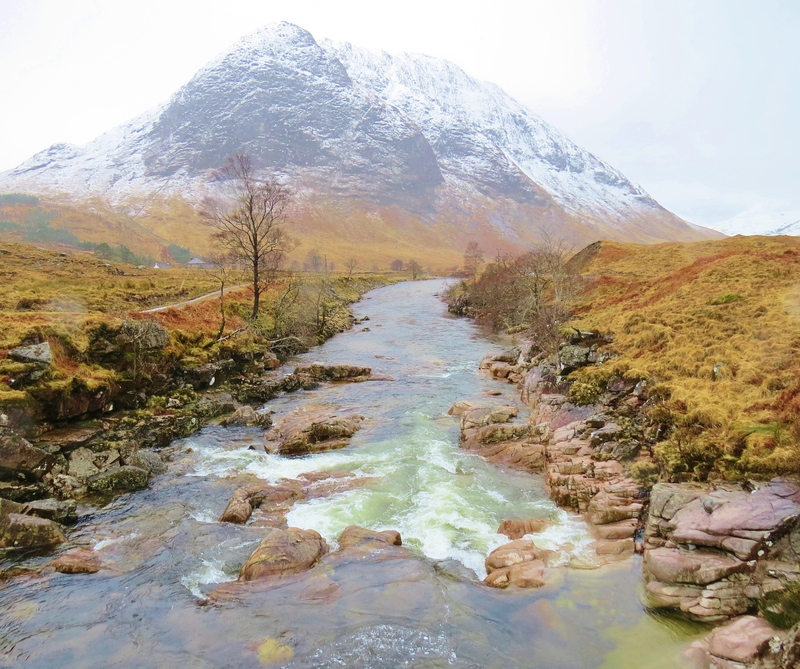 For the most part, though, tourists, awe struck by the wild grandeur of Glen Coe, are still unaware of the unimagineable beauty on the other side of the mountains shared by both glens. 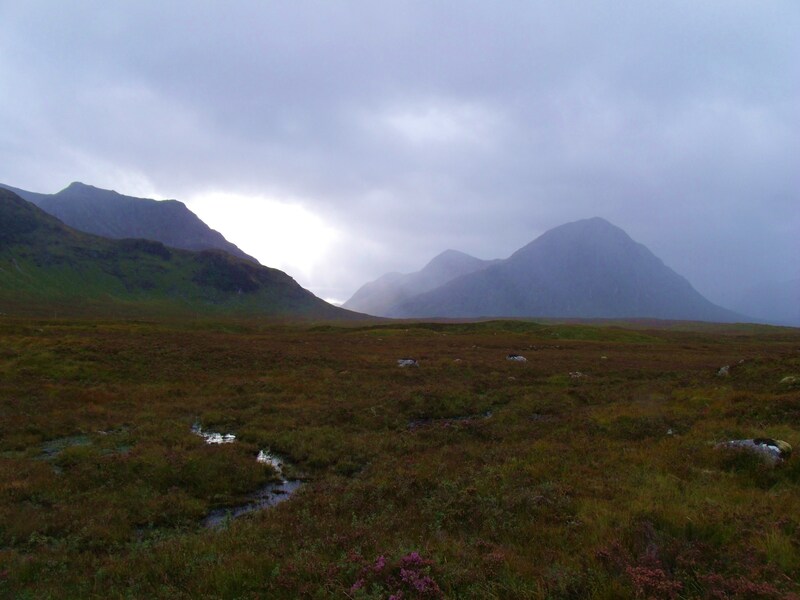 The Three Sisters, and The Two Herdsmen – Buachaile Etive Mhor (Big Shepherd of Glen Etive) and Bauchaile Etive Beag (Little Shepherd of Glen Etive) being the best known. 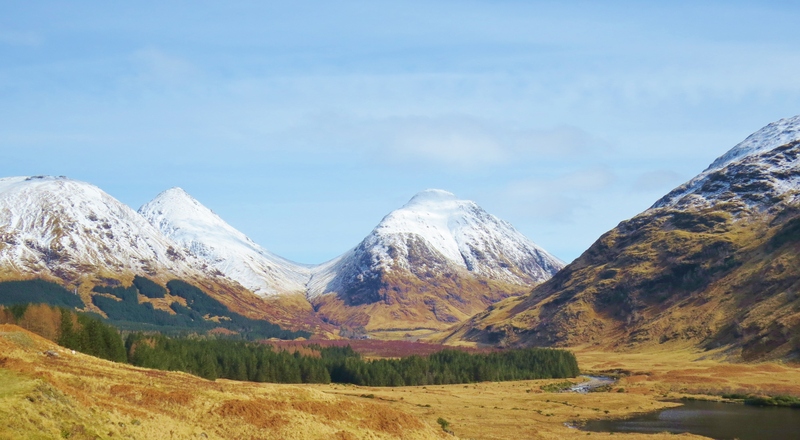 What appear to be two separate mountains on the Glencoe side, are actually twin peaks of one as seen from Glen Etive, The dip between the two summits creates a perfect mountain pass connecting The Great Glen (Glen Coe) with Glen Etive. 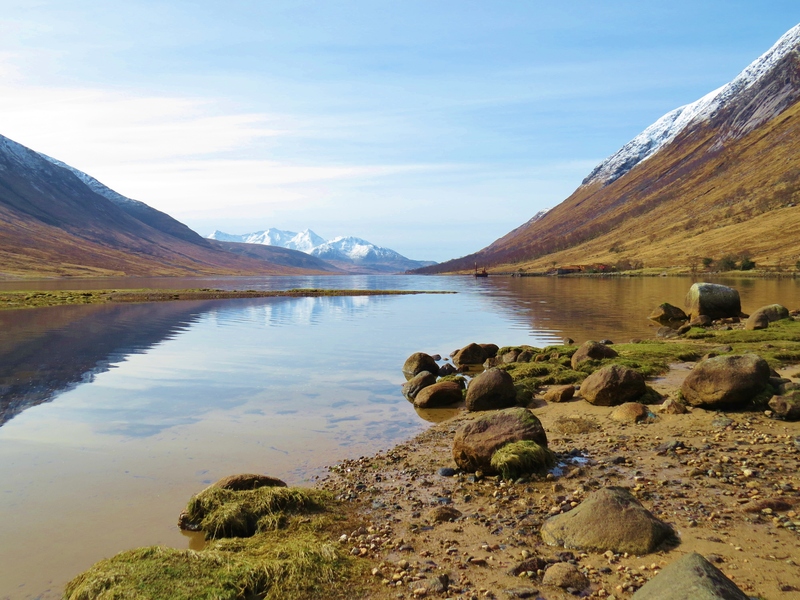 In the mountains of Glen Etive, the lochans are great places for anglers to catch both brown and rainbow trout. 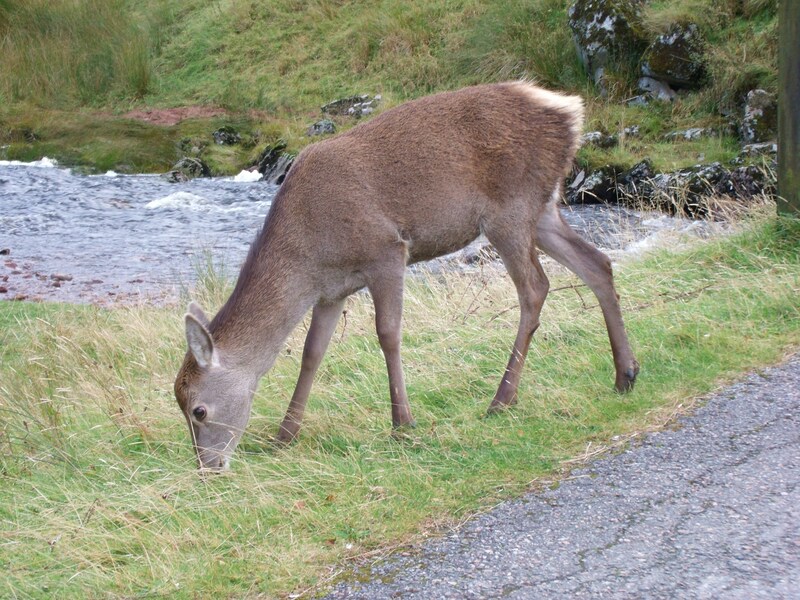 Those in the valley provide watering holes for the many deer that make Etive their home. 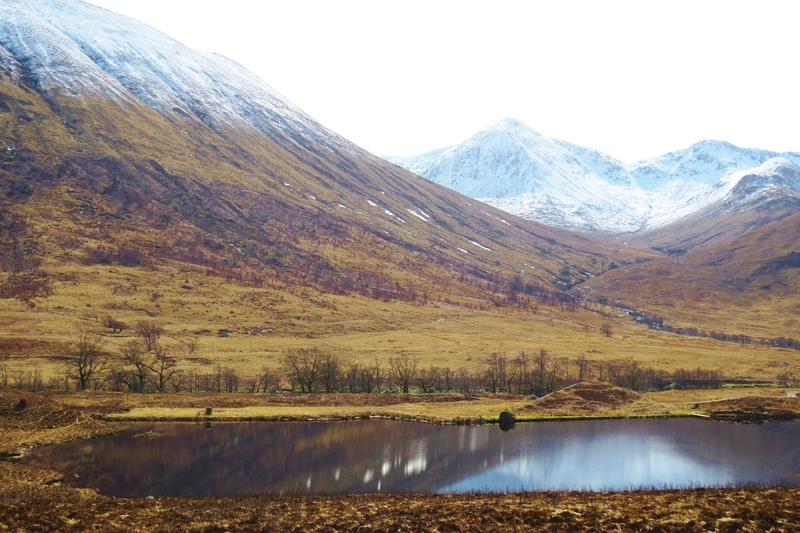 How to get there: The road to Glen Etive is just that. A one lane road turns left off the A80 just past the Kings House, around the base of Buachaille Etive Mhor. 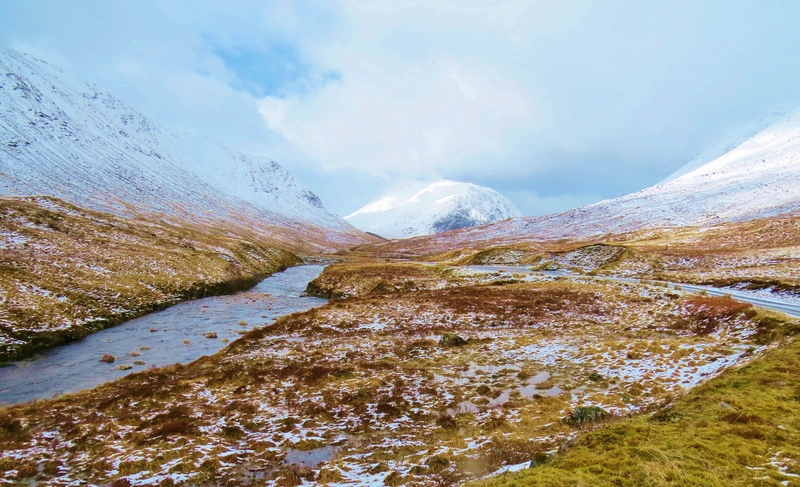 Running alongside the river for much of the way, it heads north west through Glen Etive, reaching Loch Etive fourteen miles later It goes no further. 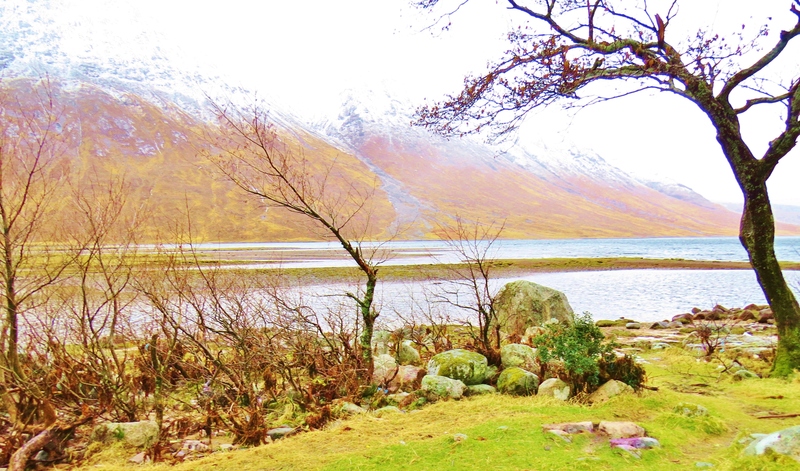 Where to stay: Few could afford to stay in the scarce but costly accommodation in Glen Etive. The only option, short of camping, is to stay in Glencoe. Booking ahead at hostels or hotels is strongly advised as places are limited. 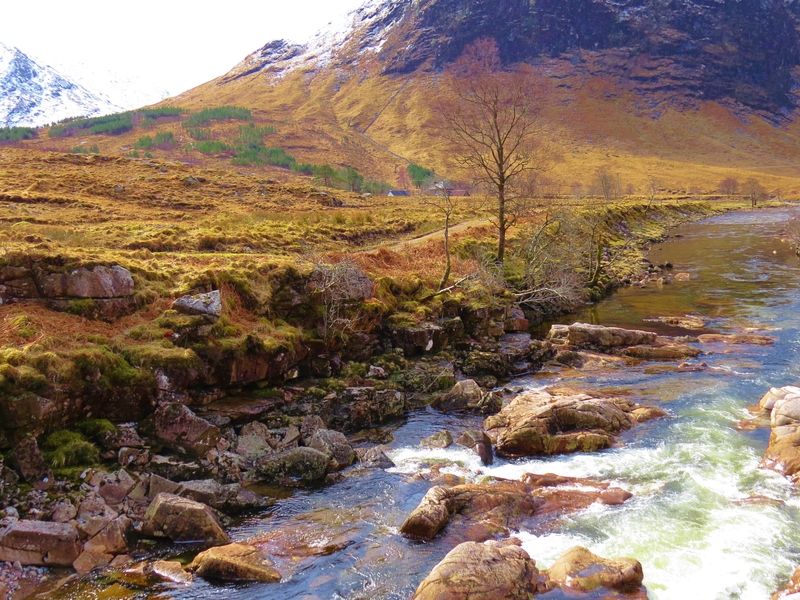 Note: To visit Glencoe without experiencing Glen Etive would be a serious omission. If, like me, you are on foot and short of a way to get there, contact Keith at Go Glencoe. He is a wonderful guide and accommodates groups or singles, taking on difficult mountain terrain, a leisurely photo safari, and everything in between.